Playing board games is entertaining, but that is only one benefit of board game playing. 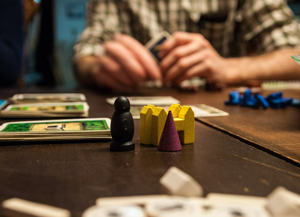 There has been quite a resurgence in the popularity of board games, and for many people, playing board games connects them with their past. A few of the many benefits are the following. Playing board games brings people closer, strengthens relationships, and can help you meet new people. Board games can be for two or more players. The foundation of board game playing is cooperation. It requires players to engage by teamwork. It is the perfect way to spend time in nice company and strengthen bonds with other human beings. Playing board games increases brain function. Playing is exercise for your brain. Playing stimulates brain areas that are responsible for memory formation and complex thought processes for all ages. Engaging in play assists in practicing essential cognitive skills, such as decision making, higher level strategic thinking, and problem solving. Playing board games teaches you how to set goals and be patient. Winning takes strategy and patience. In a happy environment these things are learned in a stress-free and challenging but fun way. Playing board games is great for reducing stress and makes for laughter. A side effect of board game playing is laughter. It is one of the vital ingredients for an enjoyable learning experience and increasing creativity. Also, laughing and having a good time in general helps to decrease stress. Playing board games creates more happiness. Playing board games triggers the release of endorphins, the body’s natural “feel-good” chemicals. “Happy hormones” have the power to improve conscious and unconscious mind functions, leaving a person feeling cheerful, compassionate, and ultimately content. Playing board games enhances creativity and self-confidence. Playing board games is a perfect opportunity to connect and open up; it also helps to display a creative side of personality in non-intrusive ways, which can be beneficial for quiet individuals. Board games are an amazing tool for shy children and timid adults. Playing helps them to develop stronger senses of individuality and creativity. This leads to greater self-esteem and a feeling of being included and noticed. You can play board games anywhere at any time. There are no restrictions, no pressure! It’s one of the greatest things that board games can be played anywhere and anytime. The possibilities are endless! You may feel excited, adventurous, courageous or, perhaps, even lonely and sad, but there’s always a chance to play and connect with like-minded people. the Badge Squad Board Gaming Genius badge that kids can earn.